You can throw this easy seaweed salad recipe together in about half an hour, even on a busy weeknight. Serve it as an appetizer or an entree! The secret to this super easy seaweed salad is cheating. Instead of making your marinade and dressing from scratch, give yourself a break and use a bottled Asian-style vinaigrette. I used Annie’s Shiitake and Sesame Vinaigrette, but you don’t have to use this one specifically. Any Asian-inspired vinaigrette that you like will work well in this recipe, so go with what you love! If you’ve never cooked wakame, the seaweed I use in this salad recipe, before, don’t feel intimidated! It is so, so easy to do. To make the seaweed part of this salad, simply soak your dried wakame, then simmer in boiling water for five minutes. Drain, and you’re ready to toss into this very simple salad. 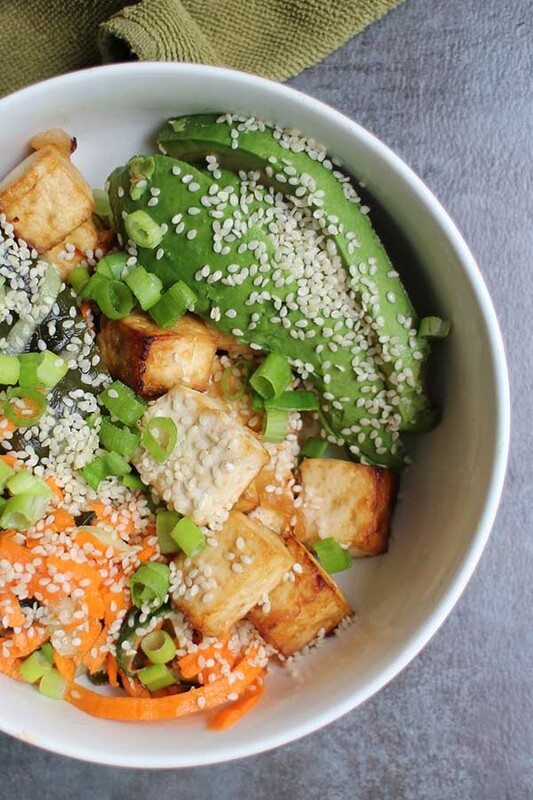 While the seaweed soaks and simmers, make your tofu in the oven or the air fryer (see below for tofu cooking options), and prepare your veggies. When the seaweed and tofu are cooked, toss it all together with your dressing, and you are ready to eat. To transform this into a full one-bowl meal, serve it over a bed of rice, quinoa, or noodles. So simple! The recipe below calls for making your tofu in the air fryer, which is definitely the easiest way to get that fried crunch. If you don’t have an air fryer, don’t worry! 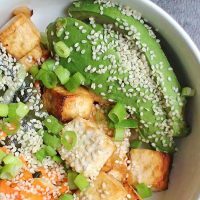 You can bake your tofu in the oven or fry it on the stove instead. 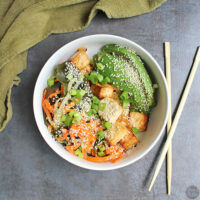 This recipe works deliciously with my Restaurant-Style Crispy Tofu, which you prepare on the stovetop. If you prefer baked tofu, follow the baking instructions for my Salt and Pepper Tofu. 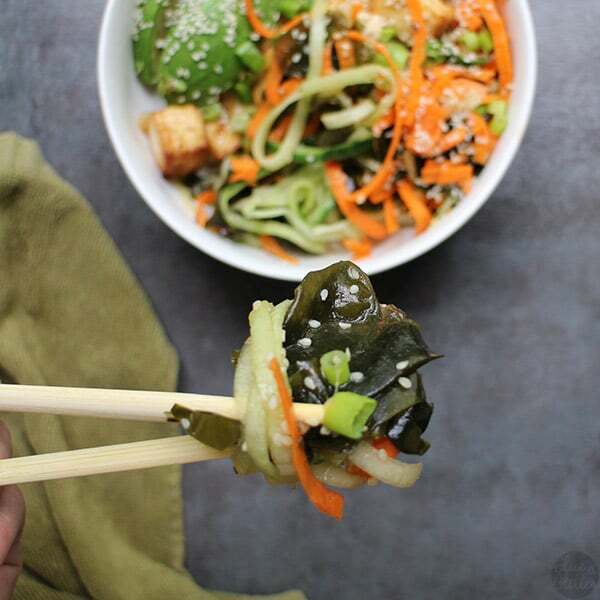 Your tofu will be more chewy than crunchy, but that chewy texture also mixes well with the seaweed and other veggies, so don’t fret! 1 batch Crispy Air Fried Tofu – Start on the tofu while the wakame is soaking. Soak the wakame for 5 minutes. Drain and chop into bite-sized pieces, then boil for 5 minutes. Drain again and stick the wakame in the fridge to chill. 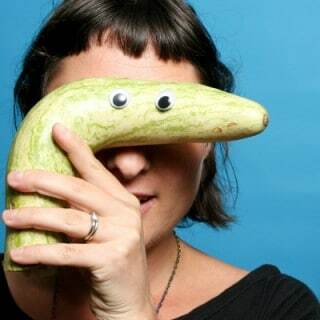 Chop your cucumber and your carrots or send them through your spiralizer. Toss the cukes and carrots with the chilled wakame. Top with the tofu, sesame seeds, avocado, and green onion. Serve immediately. I’ve never used seaweed in a recipe before but your salad looks delicious, Becky. Love the video too! Scheduled this post to pin. Thank you for being a part of our Hearth and Soul Hop. Hope to see you again this week! This looks so delicous, Becky! I love seaweed! This looks like the PERFECT lunch to me. So fresh and flavorful. That looks so healthy and easy to make, beautiful colors too! This looks so delicious! I love all the different flavors and textures here!